smooth commercial finish/annealed (dead soft and very malleable) and manufactured to ASTM-B152 specifications. 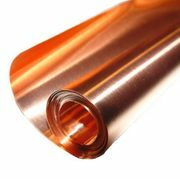 These are premium copper sheets that can be used for DIY projects, various home improvement projects, construction projects, and arts and crafts projects as well as manufacturing, electrical applications, research/development, and much more. These sheets are packaged to provide superior protection during transit to ensure delivery without damage. Qualifies for FREE UPS GROUND SHIPPING! If you don�t see the size you need, want to discuss your project, or have any other questions, please contact us via phone at 252-491-2812, email at info@basiccopper.com or try our "live chat" feature for immediate assistance!